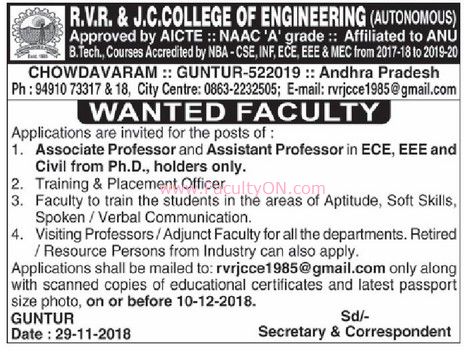 R.V.R & J.C.College of Engineering, Guntur has advertised for recruitment of Associate Professor / Assistant Professor Plus Non-Faculty jobs vacancies. Interested and eligible job aspirants are requested to apply on or before 12th December 2018. Check out further more details below. About College: R V R & J C College of Engineering is an engineering college in Guntur, offering graduate and undergraduate education courses in engineering and technology. It is located in the west suburban region of Guntur City, India. How to Apply: Interested and eligible candidates are requested to send their application along with CV, scanned copies of certificates, copy of PAN card, copy of Aadhaar card and recent PP size photo to the email address provided here.